Orthodontic tooth movements are of various types depending on the amount of force and time duration the force is applied for. So for getting the correct type of tooth movement we need to maintain required amount of force. 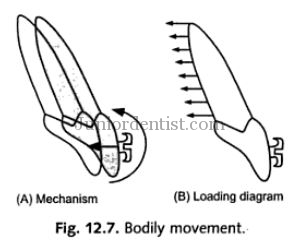 Bodily Movement: This is the most desirable type of tooth movement in Orthodontic treatment. Both the crown and root move in the same direction either labially or lingually the same amount of distance. Intrusion: It is defined as the axial movement of the tooth along the long axis towards the apex of the root. It is the type of tooth movement which requires least amount of force. Extrusion: It is the Axial movement of tooth along the long axis towards the Coronal part of Tooth. Torquing: It is the labio-lingual movement of root compared to the Tooth. Uprighting: It the type of tooth movement which is used to correct either mesially or distally tilted tooth. Rotation: It is the defined as the spinning of tooth along its own long axis which can be achieved by applying a couple of forces together where one force gets nullified and only one movement exists which causes rotation. For treating any patient with malocclusion multiple forces need to be exerted on teeth to get the end result of the desired occlusion. So keeping all the types of tooth movements and the amount of force exerted by each type of tooth movement the duration of application of each force varies accordingly. For example in cases of Anterior Overjet with deep bite, the forces required as Tipping movement and Intrusion which need to be exerted based on the tooth movement achieved. i m 28 years old and have 0ne bottom 06 no. extracted 15 years ago due to which there is a tipping movement of 7 no. i want to correct thee tipping movement and move 7 and 8 along body line to create a space for implant. For getting tooth movement of the Molars, Orthodontic treatment is the only option. If the tipping movement is not excessive removable appliances can be used, in case of severe tipping fixed movement is compulsory. Your information was very helpful. Can you give me references for your information on forces? Hi Varun, I had a question about molar movements. I am a student hoping to pursue orthodontics. 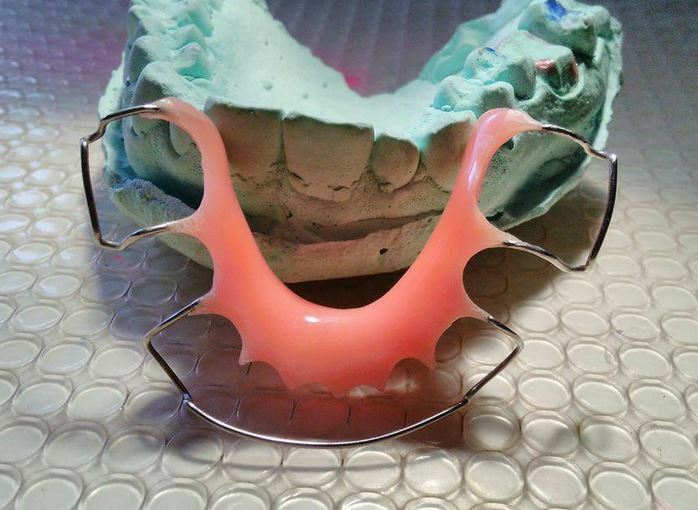 In the past I had braces which required me to have rapid palatal expanders. This changed my dental arch from a rectangle to a circle. Mostly because my premolars and molars were expanded out. I wanted to know if its possible to push them back in. If so, what would be the force needed? Is it harder to push in than out? 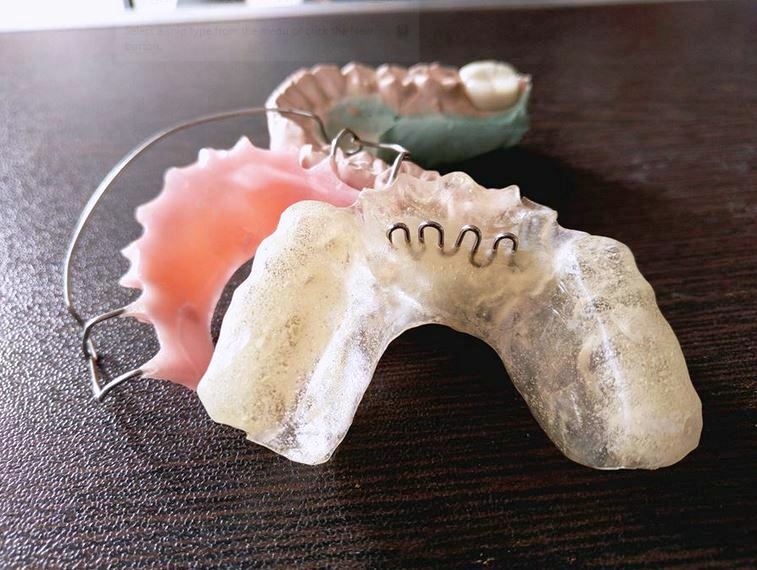 For Palatal or inward movement of molars, you require mini or micro implants in the palatal area and use of any appliance or elastics to bring in the Molars. Yes, it is a bit difficult to move the molars inwards or palatally as compared to bucally, as the buccal bone is thin in comparison to the palatal bone which is thicker. It depends on the amount of inclination of the teeth based on your jaw bone. If there is only proclination then only tipping movement will be sufficient. In case there is a spacing between the teeth which cannot be closed using only tipping movements then a combination of tipping + bodily movement is required.